Beginning January 18, students, teachers and parents across Illinois will have an opportunity to participate in the sixth annual statewide Illinois 5Essentials Survey. This survey is designed to generate a detailed picture of the inner workings of your child’s school. As a parent, this opportunity will allow you to share your thoughts on the important elements of school effectiveness in a survey about your child’s school. All teachers, parents, and grade groups at 6th through 12th will be responding to this survey. 5Essentials Reports will be generated for schools if their teachers and/or students meet the response rate threshold of 50 percent. These reports will be sent to schools and districts in March 2018 and will also be included in the State School Report Card. Additionally, your district has chosen to provide the optional 5Essentials parent survey. If at least 20 percent of each school’s parents complete this survey, a parent supplement will also be generated. The parent data will not be reported on the State Report Card. 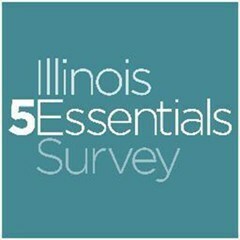 For more information about the Illinois 5Essentials Survey, or to view previous years’ Reports, please visit https://illinois.5-essentials.org. If you have any questions or concerns, please contact 5Essentials Client Services at 1-866-440-1874 or 5essentials@uchicago.edu.